In a time when the actions of bankers and hedge fund managers fuel instability not only in financial markets but also in the market for advanced art, many in the art world complain bitterly of the invasion of their sacred domain by these crass and unworthy money-lenders. These delicate souls should all be required immediately to travel to Florence, to see an exhibition at the Palazzo Strozzi titled "Money and Beauty." There they would learn that not only is the connection between art and money not a recent development, but that the growth of the modern banking system was closely linked with basic innovations in our artistic heritage in Renaissance Florence. In the catalogue for "Money and Beauty," the chairman of the Fondazione Palazzo Strozzi, Lorenzo Bini Smaghi, observes that "the events of recent years, including the near collapse of the banking system in 2008 -- due in part to innovative and perhaps overly risky financial assets -- make an exhibition on the birth of banking and financial speculation particularly timely." A monetary economist who is a member of the Executive Board of the European Central Bank, Bini Smaghi is in a position to understand how true this is. Among the exhibition's many specific lessons for us is that the word risk is derived from a Tuscan term, rischio, which allowed bankers to receive a return on their loans that would not be considered interest, and consequently would not violate the Christian ban on usury. Thus centuries before Occupy Wall Street, a fundamental term in the economic analysis of markets emerged from an early clash between the realities of market transactions and a powerful prevailing system of morality. More broadly, what "Money and Beauty" demonstrates is the variety and complexity of the interrelationships between art and money in the Renaissance. The prosperity of Florence rested in significant part of the city's creation of the golden florin in 1252. This new coin replaced the much less valuable silver coins that dated from the time of Charlemagne, and the florin's timeliness was witnessed by its rapid spread throughout Europe. And as it spread, it carried with it the message that Florence was an innovator in money and banking. Florentines were soon hired to oversee mints and mines in many financial centers, and Florentine banks established operations in many of these. At home in Florence, merchant bankers dominated the local economy, and culture. They decorated churches with beautiful paintings and sculptures, and when they had filled the churches, they decorated their own homes; when these were filled, they built magnificent palazzos that covered whole city blocks, and filled them with art. Artists made images that served their patrons in many ways. They painted the Madonna and Child for their patrons' chapels, and portraits of their patrons in luxurious gowns. They also painted allegorical scenes in which bankers and money-lenders practiced their trades, and episodes in which merchants benefited from divine intervention. Florentine merchant-bankers publicly demonstrated their vast wealth and great piety through the large and elaborate canvases they commissioned, and often through the ornate gilded frames they had made for them, and they demonstrated their refinement and exquisite taste by employing master artists who were known throughout Italy for their genius. Visitors to Florence could only marvel at the results. In 1459, the son of the Duke of Milan was amazed by what he saw at the Palazzo Medici -- "the decorative tapestries, the chests of inestimable craftsmanship and value, the masterful sculptures, the infinitely varied patterns and silverwork" -- and he neglected to mention the greatest treasures of all, paintings by such masters as Fra Angelico and Filippo Lippi. The young Galeazzo Sforza was no more perceptive in his analysis of the source of these works, as he concluded that "money alone" could not compete with these achievements. Yet in fact Tim Parks, the co-curator of "Money and Beauty," writes that everything Sforza saw "had all been bought with money, everything depended on the financial clout of a major bank." In general, adds co-curator Ludovica Sebregondi, "Patronage is the link that brings art and the economy together." The specific effects of patronage are spectacularly illustrated in this exhibition, which offers beauty as well as enlightenment. 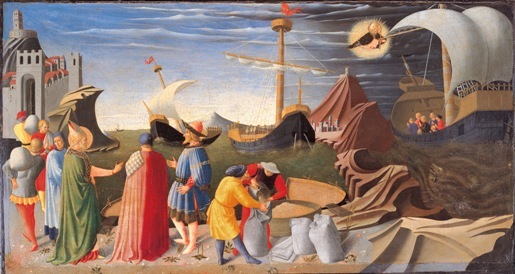 Among the visual highlights is an altarpiece by Fra Angelico that depicts St. Nicholas rescuing a sailing vessel. The painting's abstract forms and subtle colors suggest a clear link between the mid-15th century and early Surrealism. The exhibition features a number of paintings by Botticelli, including a superb Venus that isolates the central figure from the famous Uffizi Birth of Venus, highlighted dramatically against a dark background. "Not by usura was La Calumnia painted," declared Ezra Pound in a poem as powerful as it is historically inaccurate. In fact, it had been the banking system and the whole mercantile world (including the practice of money-lending) that made possible the great commissions for works of art . . . In this fascinating world, Money and Beauty were at the service of one another, allowing the creation of immortal masterpieces that have indelibly marked one of the most important epochs in the history of mankind.